1. Kroger bets on automation: Kroger has agreed an exclusive deal with UK online supermarket to use its automated warehouse technology in the United States. Kroger (KR) will also take a stake of 5% in Ocado (OCDGF) with an investment worth about £183 million ($247 million) as part of the deal. Ocado said it considered Kroger the best positioned supermarket to succeed in the US online grocery market. The British company has struck similar deals with supermarket chains in France, Canada and Sweden in recent months. Shares in Ocado shot up 44% in London after the announcement, to a new record high. 2. Retail earnings: Walmart (WMT), the world's biggest retailer, will publish first quarter results before the opening bell. Walmart's stock is down 13% so far this year, hurt by concerns about its online sales growth. Analysts are watching the company's online performance to understand whether and how it can compete with Amazon (AMZN). Walmart's $16 billion deal to buy Indian online retailer Flipkart also got an icy response from investors. Nordstrom (JWN) will report earnings after the closing bell. The company just opened its first standalone men's location, a gadget-heavy store in New York that's designed to lure shoppers with a unique experience. Investors will want to know how customers are responding. 3. Italian jitters: Italian stocks and government bonds dropped on Wednesday, after reports of a leaked draft coalition program between two populist parties spooked investors. The main market in Milan recovered slightly on Thursday, but was still around 1.5% lower for the week. The draft suggested the new Italian government could ask Europe to relax budget rules and cancel a big chunk of its huge debt. "The worsening outlook for economic policy, resurfacing anti-euro narratives and the new government's lack of expertise may be more than enough to undermine market confidence — and with it the fragile Italian economic recovery," Federico Santi, analyst at Eurasia group, wrote in a research note. The euro also sagged on Wednesday but was stable Thursday, holding its ground against other major currencies. 4. 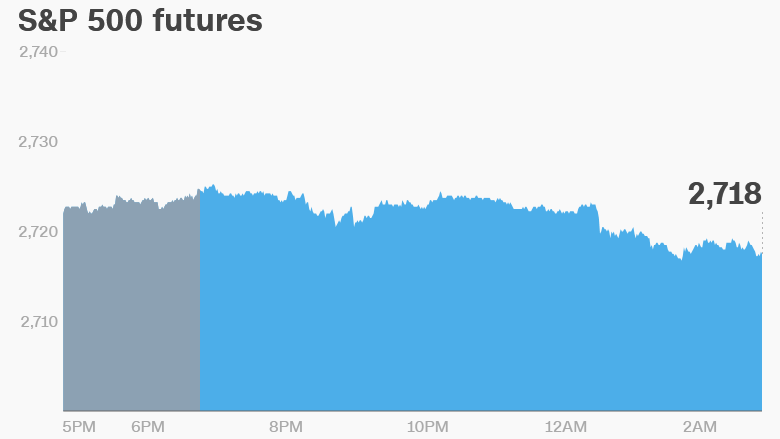 Global market overview: US stock futures were lower early on Thursday, and markets in Europe and Asia were mixed. The Dow Jones industrial average closed 0.3% higher on Wednesday, while the S&P 500 was up 0.4%, and the Nasdaq gained 0.6%.